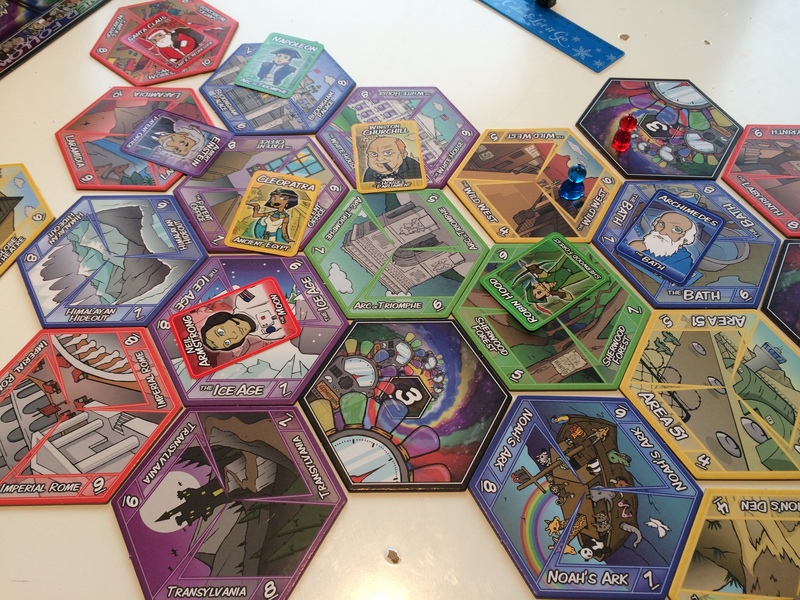 A game for 2-6 players, Follow has the players travelling around the world and through time, exploring new places and returning historical figures to their rightful homes. A break in space-time has caused vortexes to appear. The players all begin on that starting vortex hex piece before beginning their exploration. A player always gets at least one action on their turn, and in the beginning this will be spent on exploring new places. By doing so, the player adds a new hex piece down adjacent to the one they are on, revealing a new Follower in that location before moving their pawn there also. 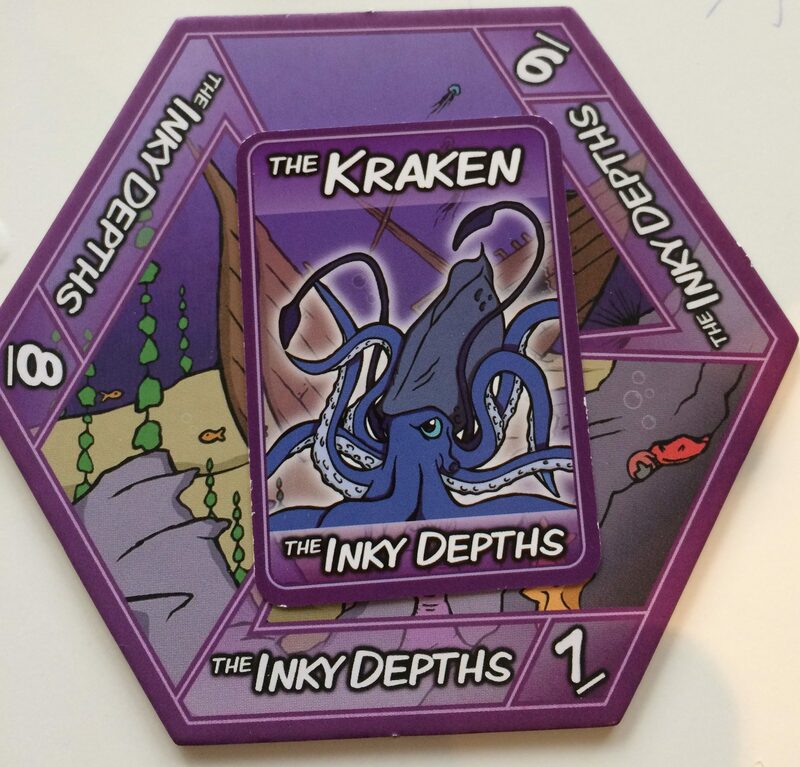 Followers need to be collected by the players and returned to their rightful homes, and the players need to return one follower of each colour before attempting to close the vortexes and thus winning the game. As mentioned, players get to take at least one action on their turn. However, they get the chance of taking further turns by rolling a D10 and trying to equal or better the number of the space they are on. All the locations are coloured the same as the Followers. If a player has an active Follower on their board (they can have at most 3 active Followers that they are transporting) that is the same colour as the location they are currently on, then they are allowed to roll a second D10 in this effort. Follow has to be the only game I know of however, where if the player rolls a double then it is an automatic fail and play moves on to the next player. Players are also able to attempt to steal Followers off other players. This adds an element of sabotage to the game. I have been playing Follow mostly with my children, and they don’t tend to go for the stealing tactic. What really is fun for the kids is the fact that the might discover Santa in the Bathtub. Or Nessie in Buckingham Palace. Or the Yeti in the Wild West. That’s when you can see them strategising over how they can get to the Follower first, possibly by jumping through vortexes, to pick them up and take them home. Once you have collected a Follower of each colour you have the opportunity to win the game. Note that word, opportunity. Here another random dice roll is required. As you can see in some of the images above, the players Gizmotron has coloured lightbulbs on it numbered 4-8. To win the game, a player that has collected a Follower of each colour must make their way back to a portal and roll the D10. If they get any number NOT on their card (1-3, 9, 10), then they win the game. If, however, they roll one of the numbers on the Gizmotron, they have to put the associated Follower back into play. Fortunately, every time we played, when this roll was made the player was successful first time. Otherwise, this is just a stupid rule. 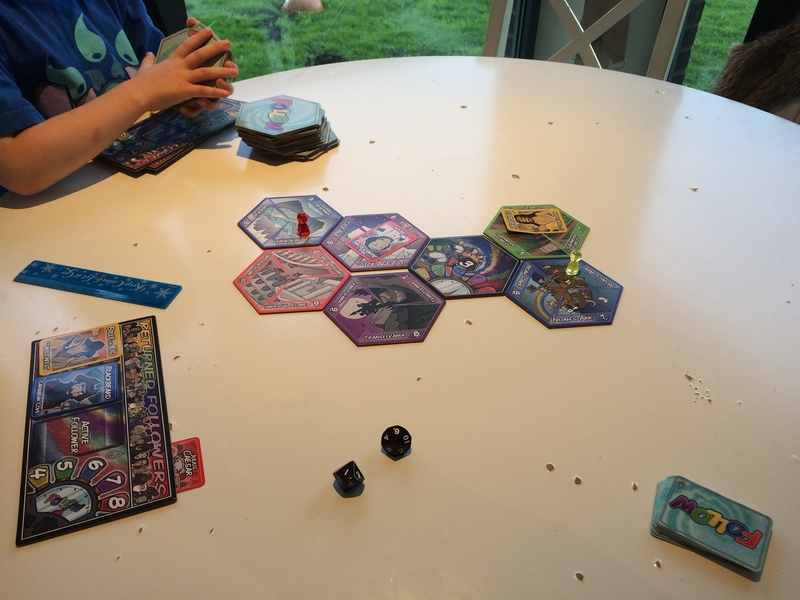 The fact that the board grows as you play means that no two games of Follow are the same. The game starts with just a single tile and the players need to continue to explore for a good while before they will be able to start manoeuvring the Followers back home. It is possible for the layout to become a bit unwieldy, so a large play space is advised. The “have another go” mechanic is a bit of a strange one, and it can lead to someone who rolls lucky to go on a bit of a run of turns while everyone else just sits and waits. 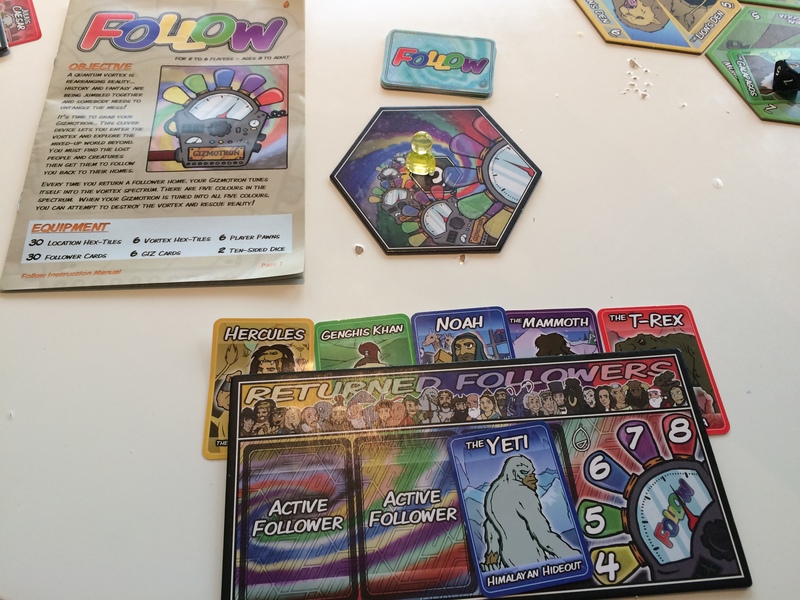 Other than that, Follow is a good fun game that can also provide a bit of education for younger audiences.